When you are arrested it can seem like a bad dream. You are probably feeling a whole slew of emotions and are running on adrenaline. Because you are confused, scared and most likely a little angry, often your emotions get the better of you and you will try to resist the arrest. The problem with resisting an officer is that it is a crime in itself. Furthermore, often times when you do resist your arrest, you do so by using violence, whether this is a punch, a kick or a blow to the head. The good news, however, is that Jeff Dean has successfully handled many cases involving resisting arrest. For an experienced lawyer you can trust, call Jeff Dean at (305) 967-6311 or (954) 204-3633. Any violent crime that has to do with law enforcement is seen as a felony offense. Hitting, punching, pushing, bashing or even touching a police officer the wrong way can be seen as battery or resisting arrest. This conviction is punishable by up to 5 years in jail and a $5,000 fine. Resisting an officer with violence is considered a third degree felony offense in Florida and it will impact the rest of your life. You don’t want a violent crime on your record as it will impact your ability to secure a job and find housing in the future. One of the biggest issues when faced with this charge is that it is often based on he-said-she-said evidence. He may say that you were resisting arrest but you could argue that he was using excessive force and you were just reacting to the force in self-defense. There may be key witnesses that were present at the altercation and a look into the past of the police officer might show that he is actually known for using excessive force. Other defenses are that the officer was not engaged in the execution of a lawful duty or that your actions were not “violent” as defined by the statute. 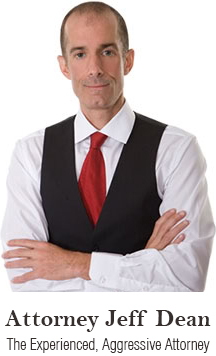 Jeff Dean can work with you to ensure that your legal rights are protected. There are several defense tactics we can take to defend against this accusation. Call Jeff Dean at (305) 967-6311 or (954) 204-3633 for a free consultation.